The conservation movement recognizes the limitations of just of saving individual parcels and creating parks and protected areas to address the big issues of protecting watersheds and habitat. The solution is to work towards landscape scale conservation. However, as the recent February 2002 report by the Regional Plan Association notes “There is little published information on the science and management of landscapes.” The Regional Plan report, which is aimed at practioners who are working at this larger scale, is an important contribution to the field. With a focus on the densely populated Northeast region of the United States, the report summarizes information from an inventory of over 165 landscape scale initiatives. 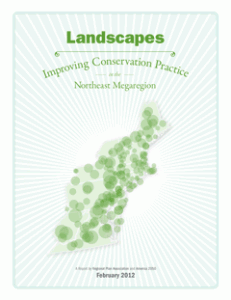 It provides a comprehensive examination of their conservation priorities and identifies their conservation challenges. But on the critical issues of improving the practice, the report only begins that conservation. Read the full report here.